I’m no longer a full-time gentleman of leisure: I’ll be writing two blog posts a week for Discovery News. My assignment is to give an out-of-the-weeds take on tech topics, explaining what they might mean to you and if they deserve a purchase, a download or a sign-up. 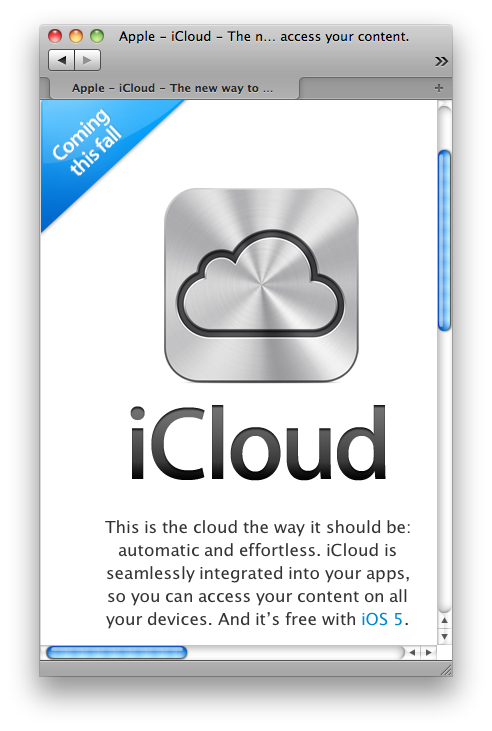 My first post for the Silver Spring firm is a look at Apple’s iCloud news. I wrote “news” instead of “service” because so much of iCloud remains open only to developers testing a beta version. Most of its features won’t ship until its iOS 5 mobile operating-system upgrade ships this fall; some will require extra work by third-party developers. But Apple did give an exceptionally detailed presentation on this upcoming set of Web-based services at last week’s WWDC event (the iCloud show starts at about the 79th minute of Apple’s keynote video). And from that and subsequent writeups, two things jumped out at me: This service will be far more device- and app-specific than other cloud services, and it also seems to have left out Web access to your content. That is, while Google Docs and Amazon’s Cloud Player, to name two competing cloud services, each require nothing more complicated than a Web browser through which you can edit a spreadsheet or play a song, Apple will make you run an app on your Mac, PC, iPhone or iPad to do those things. Its core strategy appears to involve replacing in-browser access with connected apps. Apple’s service should work much better at the machine-to-cloud intersection, because it, unlike Google or Amazon, knows what software will be waiting there. The one part of iCloud that I could test, iTunes in the Cloud, worked just as advertised: It took only one tap on our iPad2 to download a song I’d bought in my Mac’s copy of iTunes to that tablet. Then I bought another song on the iPad’s version of iTunes; within 10 seconds, it was downloading on the Mac. But if I’d wanted to listen to my iTunes collection on a friend’s computer or a work machine without downloading it at all, I’d be out of luck. And what if your hardware inventory includes more than Macs, Windows PCs and iOS devices? What if there’s an Android phone or a Linux computer in the mix? What if you can’t install Apple’s software on your work PC? Computing life isn’t always as tidy as it might look in a Steve Jobs keynote or in an Apple Store. This entry was posted in Journalism, Software, Work and tagged apple, cloud, discovery news, icloud, icloud web apps, itunes in the cloud by robpegoraro. Bookmark the permalink. Love the keys. Looks like my first typewriter from years and years ago. I’ll have to check out the Discovery scene. Great that you’re back on the scene. Art: Thanks! The obsolete text-composition hardware in the photo is a 1940s-vintage Royal Companion (bought from a friend who has a side business on Etsy; she couldn’t give me a more exact date). Sound familiar? Title: Articles By Rob Pegoraro : Discovery News , Location: http://news.discovery.com/contributors/rob-pegoraro/ . I remember the torture of trying to type high school reports on my mother’s Royal thing, I hesitate to call it a typewriter, since as soon as you got up to speed the keys would jam or the ink ribbon would fall off. Hopefully, your insightful reviews of the gadgeteria will continue for years to come, or as long as it pleases you. Sitting at a PC wrecks the body. You need an app that will alert you to get up and do some exercises. Since you don’t work in an employer’s office, do some serious exercises every N minutes. Even consider wearing compression socks to prevent blood from pooling. Someone (a Dr. Levy?) at Mayo clinic has invented a PC + treadmill desk. It is used at some call centers. Best wishes for a long career.